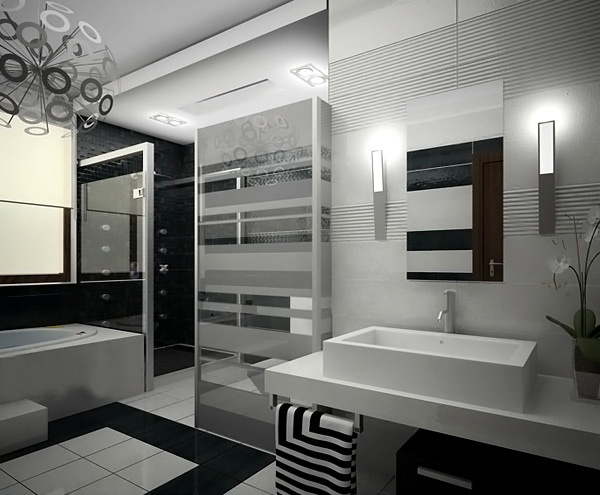 Today we will take a look at the different bathroom designs that has a touch of black and white theme. We can never deny the fact that black and white is one of the most common and somewhat famous color concept utilized by the designers. Well, it is good to know that most of the fixtures have a white color. So here you will see how the designers creatively think of the different ideas that they can apply to combine the black color. As we all know, black and white are contrasting colors. It gives out a bold statement. Although we know that this color combination has a traditional design but still it is capable to stand out among the other designs as well. Designers made use of their brilliant ideas to come up with a simple but elegant bathroom designs. Now we will end up your excitement for we will let you see the different images of the Black and White Bathroom designs below. 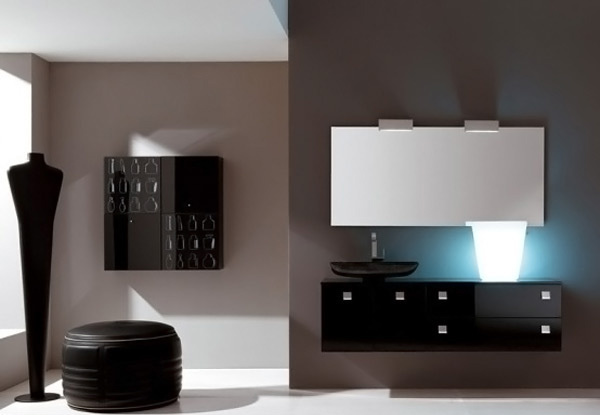 The white fixtures perfectly match the black wall and the mirror mounted on it. The smoothness of the white wash basin displays a more elegant look and jives with the glassed wall that divided the bath tub. The wall art as well as the chandelier complements the black and white striped wall. The vivid light in the corner certainly catches the eyes of the client who will use this bathroom. 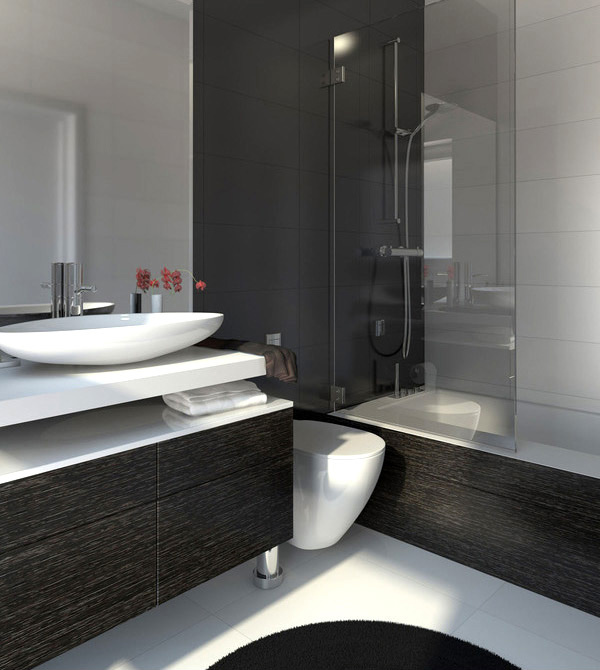 The black and white combination to form a striped effect is successfully utilized in this contemporary bathroom. 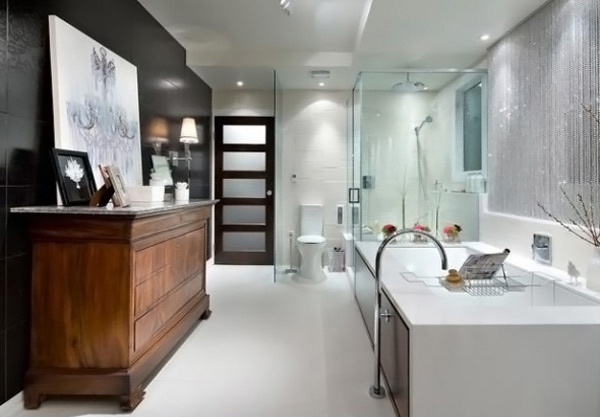 A simple black and white bathroom could be turned into a more luxurious one when you apply artistic designs. This black mounted wooden design in this wall is capable of breaking the plain white color applied in this area. This exquisite area provides a very warm and relaxing feeling. 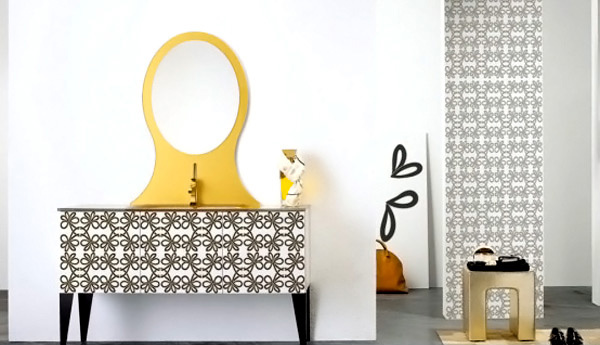 This vintage storage hutch is placed against a black painted wall in front of this very smooth white tub. 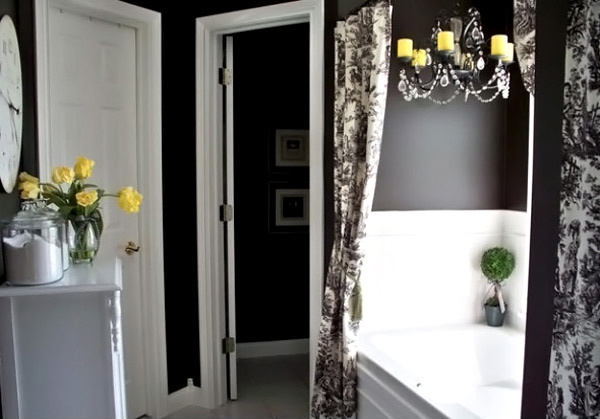 The yellow flower in the vase emphasized the floral curtain that covers the tub. The transparent glassed wall that divides the area from its shower area to the wash basin is effective. 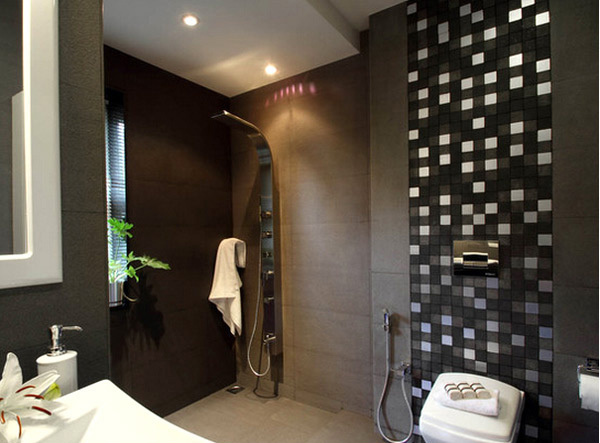 The black tiles in the shower area are one of the most captivating area in this room aside from the lights used here. The incredible shapes and curves are noticeably seen once you enter this area. 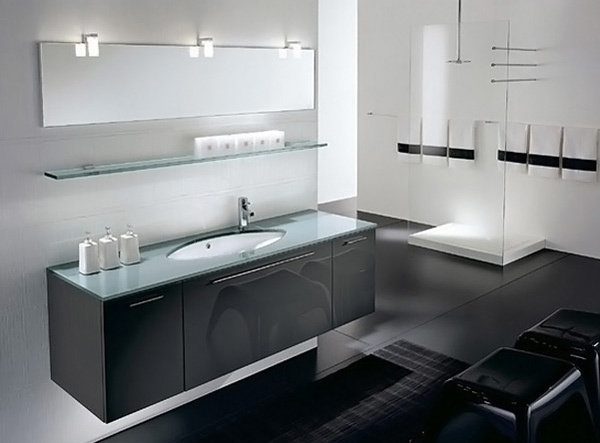 The black tinted glassed door is good enough for this black and white theme bathroom. 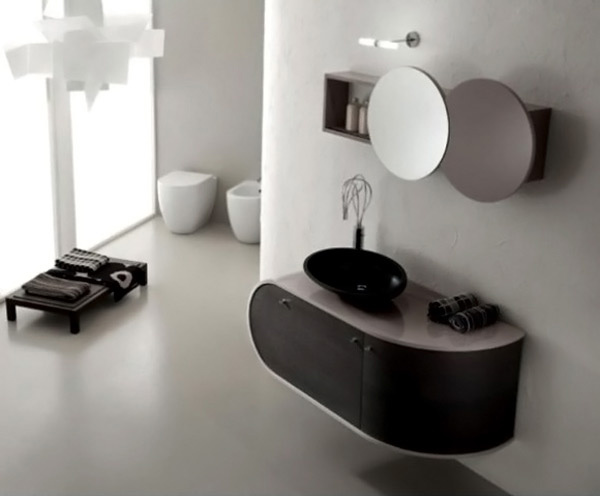 The mirror hanged above this wash basin stands out in the middle of this black wall and white floor. 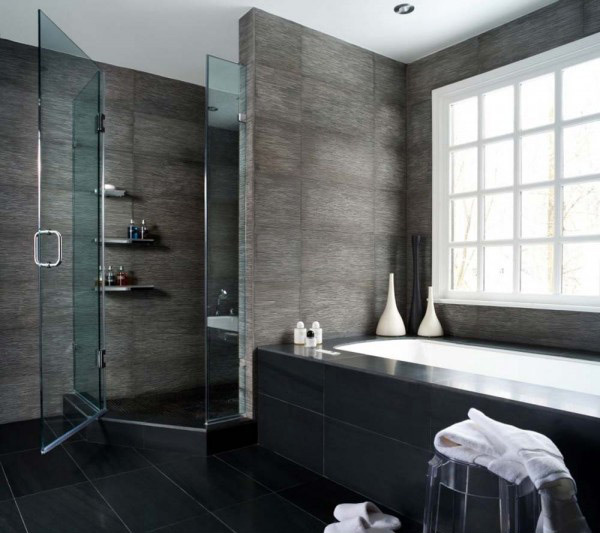 The remarkable artistic design of this black floor creates a more sensuous feeling of staying after taking a bath. The checker design utilized in this wall is capable of captivating one’s eyes when entering on this area. 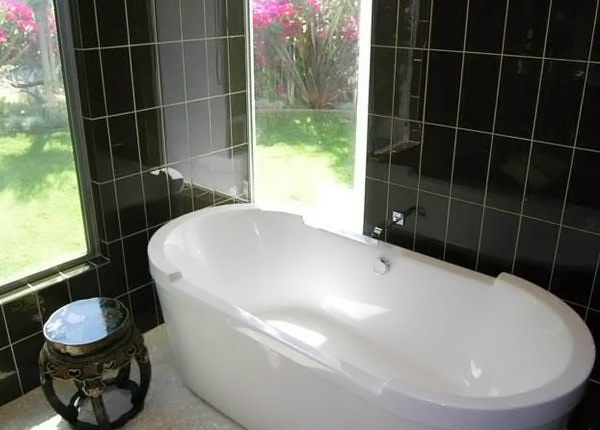 The arrangement of this white bath tub near the glassed window make you feel better and close to nature. The rectangular shape of this basin and urinals combines the unique stripe design of this wall. 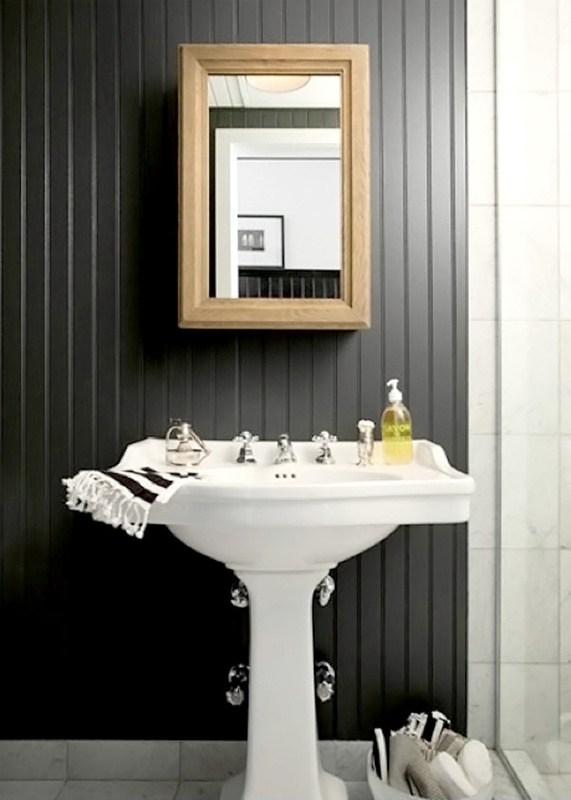 The black wooden cabinet below the wash basin breaks the plain white color of this area. 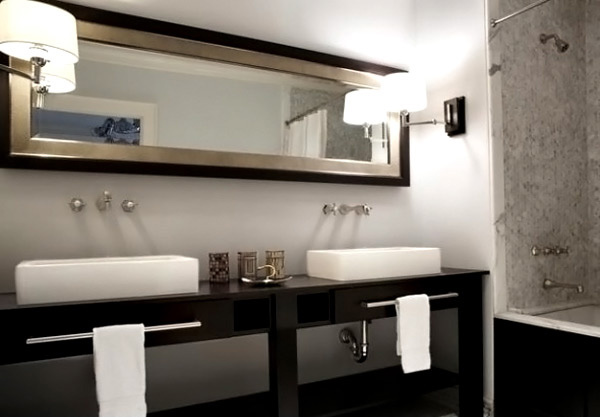 Thus, we can say that the traditional black and white colors of the bathrooms are still elegant. 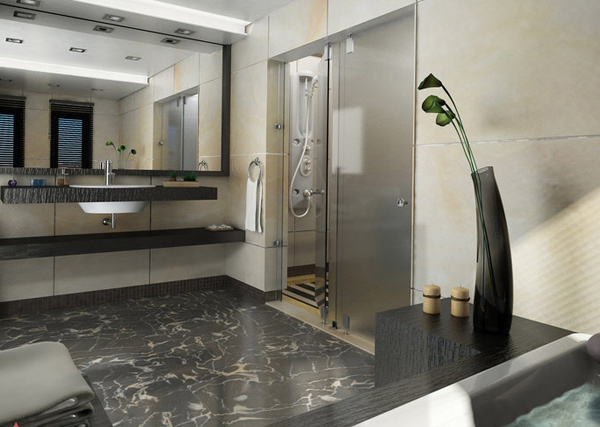 With the use of different sizes, shapes, forms of accessories and furniture will surely transforms these bathrooms into more attractive and luxurious one. The vivid lights also add life and color to these simple designs. 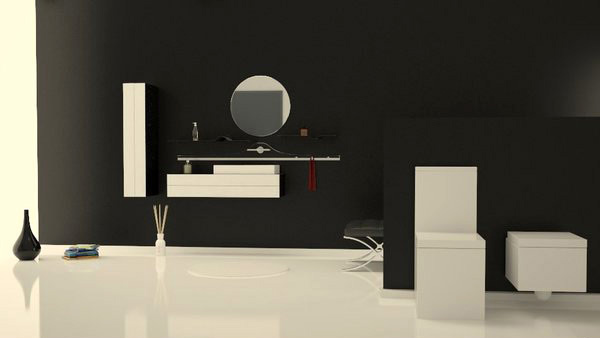 The designers successfully made this simple black and white bathroom into a more appealing one. And now we hope that once again we leave you another inspiration and helpful ideas on how to make your black and white bathrooms look livelier. What do you think? But if you want to make use of white, you can take a look at our collection of 20 Exceptional and Stylish White Bathroom Designs for inspiration.